We don’t work for any insurance company. We work only for you, the patient. Thomas Jefferson and Alexander Hamilton–two of the most influential Founding Fathers–were also fierce rivals with two opposing political philosophies and two radically different visions for America. The scene is Capitol Hill. It’s the year 2035. Thousands of elderly protesters assemble outside the Capitol building. Inside, the House Ways and Means Committee meets to enact huge cuts in both Medicare and the national health-insurance program. Members are reluctant to take this step, but there’s no choice. Although Congress raised the Medicare payroll-tax rate to 15 percent a decade ago, the Medicare program is still woefully insolvent, consuming 40 percent of the $10-trillion federal budget. Because the total burden of payroll taxes for all social programs has reached 45 percent, the Congressional Budget Office estimates that half of the U.S. economy has gone “underground,” like Latin American economies in the 1980s. Another hike in payroll taxes would only drive more of the economy underground. But elderly voters, who now make up a majority of the electorate, have swarmed to Washington demanding “fairness,” since they have paid into the system for so many years. Sound farfetched? The numbers suggest that this scenario could actually come to pass as soon as the next decade, not way off in 2035. The Medicare program is heading for a smashup, yet our political leaders speak only of instituting new federal health-insurance programs that would cover everyone. So the history of Medicare and the outlook for the program over the next generation provide a sobering lesson for today’s would-be designers of national health insurance. Unfortunately, no one seems to be paying attention to what the Medicare experience has to teach. Today’s proposals for a universal national health-care policy typically divide into either a government-run “single-payer” system like Canada’s or a “play or pay” scheme that would require employers to provide health insurance for every worker or pay a payroll tax into a government insurance program. Advocates of such policies claim these programs won’t cost much because significant savings can be had through cost containment and other efficiencies of scale. The experience of 25 years of Medicare says otherwise. The two primary lessons of Medicare are the chronic problem of woefully underestimating program costs and the impossibility of genuine cost control. A closer look at Medicare shows why these two problems are certain to plague a government-administered universal health-care plan. The cost of Medicare is a good place to begin. At its start, in 1966, Medicare cost $3 billion. The House Ways and Means Committee estimated that Medicare would cost only about $12 billion by 1990 (a figure that included an allowance for inflation). This was a supposedly “conservative” estimate. But in 1990 Medicare actually cost $107 billion. The news gets even worse for the “out years” after that. The Health Care Finance Administration has given up making long-range projections of budget outlays of Medicare. Instead, HCFA makes calculations about the “actuarial balance” of the program—how much of the nation’s payroll will be required to pay for the program. The 1992 annual report of the Federal Hospital Insurance Trust Fund, which pays for the hospital-insurance portion of Medicare, warns that the Medicare program “is severely out of financial balance” and could go bust as soon as the year 2000. The report says expenditures from the hospital fund represented 1.3 percent of the nation’s gross domestic product in 1991 and will grow to 4.7 percent by 2065. To cover the cost, the Medicare payroll-tax rate will have to more than quadruple, from the current rate of 2.9 percent to 13.79 percent. The full narrative of Medicare’s enactment in 1965, a classic tale of legislative and interest-group infighting, is too long to recount in detail here. Proposals for Medicare-style programs began surfacing in Congress during World War II but didn’t have a serious prospect of passage until the Kennedy administration. Repeatedly in the early 1960s a coalition of Republicans and conservative Democrats defeated Medicare. The key figure in this perennial drama was Wilbur Mills, the legendary chairman of the House Ways and Means Committee. Mills refused to pass a Medicare bill out of that key committee, supposedly out of concern that Medicare would threaten the integrity of the Social Security program (to which Medicare is attached). Following the Democratic landslide in the election of 1964, which gave Democrats a 2-to-1 majority in both houses of Congress, President Lyndon Johnson exerted his influence to stack the Ways and Means Committee with new Democrats sympathetic to Medicare. Wilbur Mills changed his mind and embraced Medicare. “Mills can count” was the explanation given for his flip-flop. This new political landscape virtually assured that Medicare would sail through Congress with huge majorities. When it became apparent after the 1964 election that Medicare’s passage was likely to be a slam dunk, the American Medical Association and Republicans scurried to put forward an alternative. The AMA foolishly tried to exploit public confusion over the fact that the Medicare proposal covered only hospital expenses but not costs for doctors, surgeons, dentists, and other outpatient services. Arguing now that Medicare didn’t go far enough, the AMA sought to outflank Medicare with an alternative program that would include outpatient services as well as hospital expenses. “Eldercare,” as it was called, provided for a voluntary comprehensive insurance program, administered through the states and financed through means-tested premiums from recipients and federal matching funds. Not to be outdone by the AMA, House Republicans, under new leader Gerald Ford, offered their own alternative, which was similar to Eldercare except that it would be administered by the federal government. The hospital-insurance portion of Medicare was to be supported through a payroll tax shared equally by employers and employees. The voluntary Supplemental Medical Insurance was to be financed by premiums paid by the participants with dollar-for-dollar federal matching funds. The mechanism for increasing revenue for the hospital-insurance plan, when necessary, was the raising of the taxable earnings base. Among people who believe the American health care system needs serious reform, attention invariably turns to the large number of people without health insurance. An estimated 43.6 million people, or 15.2 percent of the U.S. population, were without coverage for at least part of 2002.1 What can be done about this problem? (2) have government pay for all or most of the cost of their insurance by subsidizing private premiums or enrolling them in public insurance. The first proposal not only involves government coercion, but also constitutes a dangerous further intrusion of government into the medical marketplace. The second proposal would require new taxes and inject billions of additional dollars into a health care system that is already the most expensive in the world. As we shall see in the next chapter, neither reform is necessary or desirable. In fact, we can have a workable form of universal health insurance without intrusive mandates or more government spending. But before turning to a solution, we should consider a more basic question. Why should government be involved at all? Aside from the burden of providing charity care to the poor, is there any reason for government to care whether people have health insurance? The traditional argument for government intervention is that health insurance has social benefits apart from the personal benefits to the person who chooses to insure. The reason is that people who fail to insure are likely to get health care anyway, even if they can’t pay for it. And the reason for that is that the rest of the community is unwilling to allow the uninsured to go without health care, even if their lack of insurance is willful and negligent. This set of circumstances creates opportunities for some people to be free riders on other people’s generosity. In particular, free riders can choose not to pay insurance premiums and to spend the money on other consumption instead—confident that the community as a whole will provide them with care even if they cannot pay for it when they need it. In other words, being a free rider works. It works because of a tacit community agreement that no one will be allowed to go without health care. And this tacit agreement is so established that it operates as a social contract that many people substitute for a private insurance contract. What evidence is there that free riders are a problem? One piece of evidence is the number of uninsured. According to the Census Bureau, a larger percentage of the population was uninsured in 2002 than a decade earlier (see figure 23.1). The rise in the number of uninsured occurred throughout the 1990s, a time in which per capita income and wealth, however measured, were rising. Although it is common to think of the uninsured as having low incomes, many families who lack insurance are solidly middle class (see figure 23.2). Further, between 1993 and 1999, the number of uninsured increased by 57 percent in households earning between $50,000 to $75,000 and by 114 percent among households earning $75,000 or more. By contrast, in households earning less than $50,000 the number of uninsured decreased approximately 2 percent. In 2002 and 2003, we reviewed The Twenty Myths of health care reform. Now a decade later the authors have updated the book, renamed it, and added important 21st century data. Chapter 22: Is Managed Competition the Answer? Most of the problems of single-payer health care insurance are well known to policy makers and government officials and even to many ordinary citizens in countries with national health insurance. Many of the obstacles posed by the politics of medicine also are well known. As a result, throughout the 1990s there was growing interest—particularly in Europe—in a new type of system, one in which health care resources would be allocated by competition in the marketplace rather than by politicians. The competition that exists in these programs, again, is not the same as one would find in a free market. It takes place under artificial rules managed by the employer or some other sponsoring organization. During its first term, the Clinton administration proposed such managed competition nationwide. Its adherents, including Stanford professor Alain Einthoven, still think this is the answer to the nation’s health care woes.6. . .
A fascinating discovery of this discipline is that economic principles, if carefully applied, explain much of what happens in politics. Take the concept of competition. Just as producers of goods and services compete for consumer dollars, so politicians in a democracy compete for votes. Moreover, the process of competition leads to certain well-defined results. In the economic marketplace, competition inevitably forces producers to choose the most efficient method of production. Those who fail to do so either go out of business or mend their ways. The outcome—efficient production—is independent of any particular producer’s wishes or desires. In a similar way, political competition inexorably leads candidates to adopt specific positions, called the winning platform.2 The idea of a winning platform is a fairly simple one. It is a set of political policies that can defeat any other set of policies in an election. Politicians who want to be elected or reelected have every incentive to endorse the winning platform. If they do not, they become vulnerable; for if their opponents adopt the winning platform and they do not, the opponents will win. Of course in the real world, things are rarely so simple. Many factors influence voters other than substantive political issues—a candidate’s religion, ethnicity, gender, general appearance, speaking ability, party affiliation, and so forth. Even when voters are influenced by real political issues, politicians do not always know what the winning platform is. Often they must guess at it. Nonetheless, public choice theory holds that, other things being equal, a candidate always improves his chances of winning by endorsing the winning platform. Hence, all candidates have an incentive to identify and endorse this platform. This line of reasoning leads to the conclusion that in democratic systems with two major political parties, both tend to adopt the same policies. They do so not because the party leaders think alike or share the same ideological preferences, but because their top priority is to win elections and hold office. Two corollaries follow from this conclusion. The first is that it is absurd to complain about the fact that “major candidates all sound alike” or that “it doesn’t seem to make any difference who wins.” The complaints are merely evidence that political competition is working precisely as the theory predicts. Indeed, the more accurate information political candidates receive through better polling techniques and computerization, the more similar they will become. The theory predicts that, in a world of perfect information, the policies of the two major parties would be identical. The second corollary is more relevant to our purposes. In its extreme form, the corollary asserts that “politicians don’t matter.” Over the long haul, if we want to explain why we have the political policies we have, it is futile to investigate the motives, personalities and characters of those who hold office. Instead, we must focus on those factors that determine the nature of the winning platform. This corollary is crucial to understanding single-payer health insurance. A great many British health economists who support socialized medicine are quick to concede that the British NHS has defects. But these defects, in their view, are not those of socialism; they merely represent a failure of political will or of the politicians in office. The ultimate goal, they hold, is to retain the system of socialized medicine and make it work better. An extensive analysis of the British health care system shows that all of the major features of national health insurance can be explained in terms of public choice theory.5 That is, far from being the consequence of preferences of politicians (who could be replaced by different politicians with different preferences in the next election), the major features of single-payer systems of national health insurance follow inevitably from the fact that politicians have the authority to allocate health care resources, and from that fact alone. The following is a brief summary. One argument used to justify national health insurance is that, left to their own devices, individuals will not spend as much as they ought to spend on health care. This was a major reason why many middle- and upper-middleclass British citizens supported national health insurance for the working class. It was also a major reason why they supported formation of the NHS in 1948.6 Many expected that, under socialized medical care, more total dollars would be spent on health care than would otherwise have been the case. Yet, it is not clear that socialized medicine in Britain has increased overall spending on health care. It may even have had the opposite result. This was the contention of Dennis Lees, professor of economics at the University of Nottingham, who wrote that “the British people, left free to do so, would almost certainly have chosen to spend more on health services themselves than governments have chosen to spend on their behalf.”7 The same may be true of the single-payer systems in other countries. To see why this is true, let us first imagine a situation in which a politician is trying to win over a single voter. To keep the example simple, suppose the politician has access to ten dollars to spend on the voter’s behalf. To maximize his chance of winning, the politician should spend the ten dollars precisely as the voter wants it spent. If the voter’s choice is five dollars on medical care, three dollars on a retirement pension and two dollars on a rent subsidy, that should also be the choice of the vote-maximizing politician. If the politician does not choose to spend the ten dollars in this way, he risks losing this voter to a clever opponent. Now it might seem that if the voter wants five dollars spent on medical care, we can conclude that he would have spent the five dollars on medicalcare himself if he were spending ten dollars of his own money. But this is not quite true. State-provided medical care has one feature that is generally missing from private medical markets and other government spending programs—nonprice rationing. Nonprice rationing, as we have seen, imposes heavy costs on patients (the cost of waiting and other inconveniences), leads to deterioration in the quality of services rendered and creates various forms of waste and inefficiency. Thus, other things being equal, five dollars of spending on government health care will be less valuable to the average voter than five dollars of spending in a private medical marketplace. It also means that, under socialized medicine, spending for health care will be less attractive to voters relative to spending programs that do not involve nonprice rationing. Public choice theory, then, predicts that the average voter will desire less spending on health care, relative to other goods and services, when healthcare is rationed by nonmarket devices. Moreover, the greater the rationing problems, the less attractive health care spending will be. So we would expect even less spending on health care in a completely “free” service like the NHS than in a health service that charged user fees. In the real world, politicians can rarely tailor their spending to the desires of a specific voter. Generally, they must allocate spending among programs that affect thousands of voters. New spending for a hospital, for example, provides benefits for everyone in the surrounding community. And no matter what level of spending is chosen, some voters will prefer more and others less. Often, the vote-maximizing level of spending will be the level of spending preferred by the average voter. DO OTHER COUNTRIES THINK THEY HAVE FOUND THE ANSWER? Despite the official rhetoric, over the course of the past decade almost every European country with a national health care system has introduced market-oriented reforms and turned to the private sector to reduce the costs of care and increase the value, availability and effectiveness of treatments.19 In making these changes, more often than not these countries looked to the United States for guidance. About seven million people in Britain now have private health insurance; and since the Labor government assumed power, the number of patients paying out of pocket for medical treatment has increased by 40 percent. To reduce its waiting lists, the British National Health Service (NHS) recently announced that it will treat some patients in private hospitals, reversing a long-standing policy of using only public hospitals;21 and, the NHS has even contracted with HCA International, America’s largest health care provider, to treat 10,000 NHS cancer patients at its facilities in Britain. Australia has turned to the private sector to reform its public health care system to such an extent that it is now second only to the United States among industrialized nations in the share of health care spending that is private. Since 1993, the German government has experimented with American style managed competition by giving Germans the right to choose among t he country’s competing sickness funds (insurers). The Netherlands also has American-style managed competition, with an extensive network of private health care providers and slightly more than one-third of the population insured privately. Sweden is introducing reforms that will allow private providers to deliver more than 40 percent of all health care services and about 80 percent of primary care in Stockholm. Even Canada has changed, using the United States as a partial safety valve for its overtaxed health care system; provincial governments and patients spend more than $1 billion a year on U.S. medical care. This book is not intended as a defense of the existing health care system in the United States. To the contrary, we count ourselves among its harshest critics. Our goal here is to dispel certain myths about health care as delivered in countries that have national health insurance. These myths have gained the status of fact in both the United States and abroad, even though the evidence shows a far different reality. In this book we will examine the critical failures of national health insurance systems without focusing on minor blemishes or easily correctable problems. In doing so, our goal is to identify the problems common to all countries with national health insurance and to explain why these problems emerge. Most national health care systems are in a state of sustained internal crisis as costs rise and the stated goals of universal access and quality care are not met. In almost all cases, the reason is the same: the politics of medicine. The problems of government-run health care systems flow inexorably from the fact that they are government-run rather than market driven. We have chosen to focus primarily, though not exclusively, on the health care systems of English-speaking countries whose cultures are similar to our own. Britain, Canada and New Zealand in particular are often pointed to by advocates of national health insurance as models for U.S. health care system reform. In amassing evidence of how these systems actually work, many of our sources are government publications or commentary and analysis by reporters and scholars who fully support the concept of socialized medicine. The failure of national health insurance is a secret of modern social science. Not only have scholars failed to understand the defects of national health insurance, too often advocates and ordinary citizens hold an idealized view of it. For that reason, we present much of the information in the form of rebuttals to commonly held myths. Read this introduction at . . .
Warren Buffet is asking each addressee to forward this message to a minimum of twenty people on their address list; in turn ask each of those to do likewise. In three days, most people in The United States of America will have the message. This is one idea that really should be passed around. Congress will no longer vote themselves a pay raise. All contracts with past and present Congressmen/women are void effective 12/31/12. The American people did not make this contract with Congressmen/women. Congressmen/women made all these contracts for themselves. Serving in Congress is an honor, not a career. The Founding Fathers envisioned citizen legislators, so ours should serve their term(s), then go home and back to work. most people (in the U.S.) to receive the message. I don’t doubt the sincerity of those Americans who want to copy the European model. A few may be snobs who wear their euro-enthusiasm as a badge of sophistication. . . .
All right, growth would be slower, but the quality of life might improve. All right, taxes would be higher, but workers need no longer fear sickness or unemployment. All right, the U.S. would no longer be the world’s superpower, but perhaps that would make it more popular. Is a European future truly so terrible? From that distinction, much follows. The U.S. has evolved a series of unique institutions designed to limit the power of the state: recall mechanisms, ballot initiatives, balanced budget rules, open primaries, localism, states’ rights, term limits, the direct election of public officials from the sheriff to the school board. The EU places supreme power in the hands of 27 unelected Commissioners invulnerable to public opinion. The will of the people is generally seen by Eurocrats as an obstacle to overcome, not a reason to change direction. When France, the Netherlands and Ireland voted against the European Constitution, the referendum results were swatted aside and the document adopted regardless. For, in Brussels, the ruling doctrine—that the nation-state must be transcended—is seen as more important than freedom, democracy or the rule of law. . .
Why is a European politician urging America to avoid Europeanization? As a Briton, I see the American republic as a repository of our traditional freedoms. The doctrines rooted in the common law, in the Magna Carta, and in the Bill of Rights found their fullest and most sublime expression in the old courthouse of Philadelphia. Britain, as a result of its unhappy membership in the European Union, has now surrendered a large part of its birthright. But our freedoms live on in America. . . So you can imagine how I feel when I see the U.S. making the same mistakes that Britain has made: expanding its government, regulating private commerce, centralizing its jurisdiction, breaking the link between taxation and representation, abandoning its sovereignty. You deserve better, cousins. And we expect better. Read the entire essay, subscription required, based on Mr. Hannan’s book . . .
A profoundly deceptive document that only marginally measured health-care performance at all. The World Health Organization’s World Health Report 2000, which ranked the health-care systems of nearly 200 nations, stands as one of the most influential social-science studies in history. For the past decade, it has been the de facto basis for much of the discussion of the health-care system in the United States, routinely cited in public discourse by members of government and policy experts. Its most notorious finding—that the United States ranked a disastrous 37th out of the world’s 191 nations in “overall performance”—provided supporters of President Barack Obama’s transformative health-care legislation with a data-driven argument for swift and drastic reform, particularly in light of the fact that the U.S. spends more on health than any other nation. WHO researchers divided aspects of health care into subjective categories and tailored the definitions to suit their political aims. They allowed fundamental flaws in methodology, large margins of error in data, and overt bias in data analysis, and then offered conclusions despite enormous gaps in the data they did have. The flaws in the report’s approach, flaws that thoroughly undermine the legitimacy of the WHO rankings, have been repeatedly exposed in peer-reviewed literature by academic experts who have examined the study in detail. Their analysis made clear that the study’s failings were plain from the outset and remain patently obvious today; but they went unnoticed, unmentioned, and unexamined by many because World Health Report 2000 was so politically useful. This object lesson in the ideological misuse of politicized statistics should serve as a cautionary tale for all policymakers and all lay people who are inclined to accept on faith the results reported in studies by prestigious international bodies. The report went on to argue, even insist, that “governments need to promote community rating (i.e. each member of the community pays the same premium), a common benefit package and portability of benefits among insurance schemes.” For “middle income countries,” the authors asserted, “the policy route to fair prepaid systems is through strengthening the often substantial, mandatory, income-based and risk-based insurance schemes.” It is a curious version of objective study design and data analysis to assume the validity of a concept like “the new universalism” and then to define policies that implement it as proof of that validity. This matter-of-fact endorsement of wealth redistribution and centralized administration should have had nothing to do with WHO’s assessment of the actual quality of health care under different systems. But instead, it was used as the definition of quality. For the authors of the study, the policy recommendation preceded the research. Automatically, this pushed capitalist countries that rely more on market incentives to the bottom of the list and rewarded countries that finance health care by centralized government-controlled single-payer systems. In fact, two of the major index factors, Health Distribution and Responsiveness Distribution, did not even measure health care itself. They were both strictly measures of equal distribution of health and equal distribution of health-care delivery. Perhaps what is most striking about the categories that make up the index is how WHO weighted them. Health Distribution, Responsiveness Distribution, and Financial Fairness added up to 62.5 percent of a country’s health-care score. Thus, almost two-thirds of the study was an assessment of equality. The actual health outcomes of a nation, which logic dictates should be of greatest importance in any health-care index, accounted for only 25 percent of the weighting. In other words, the WHO study was dominated by concerns outside the realm of health care. At its most egregious, the report abandoned the very pretense of assessing health care. 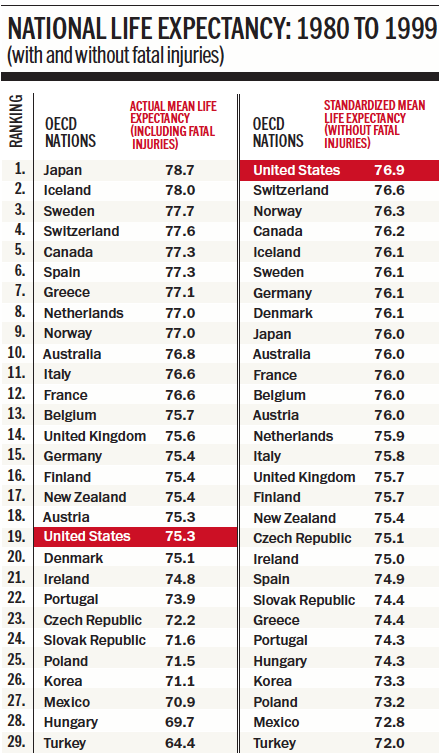 WHO ranked the U.S. 42nd in life expectancy. In their book, The Business of Health, Robert L. Ohsfeldt and John E. Schneider of the University of Iowa demonstrated that this finding was a gross misrepresentation. WHO actually included immediate deaths from murder or fatal high-speed motor-vehicle accidents in their assessment, as if an ideal health-care system could turn back time to undo car crashes and prevent homicides. Ohsfeldt and Schneider did their own life-expectancy calculations using nations of the Organisation for Economic Co-operation and Development (OECD). With fatal car crashes and murders included, the U.S. ranked 19 out of 29 in life expectancy; with both removed, the U.S. had the world’s best life-expectancy numbers (see table above). But even if you dismiss all that, the unreliability of World Health Report 2000 becomes inarguable once you confront the sources of the data used. In the study, WHO acknowledged that it “adjusted scores for overall responsiveness, as well as a measure of fairness based on the informants’ views as to which groups are most often discriminated against in a country’s population and on how large those groups are” [emphasis added]. A second survey of about 1,000 “informants” generated opinions about the relative importance of the factors in the index, which were then used to calculate an overall score. Judgments about what constituted “high quality” or “low quality” health care, as well as the effect of inequality, were made by people WHO called “key informants.” Astonishingly, WHO provided no details about who these key informants were or how they were selected. According to a 2001 Lancet article by Celia Almeida, half the responders were members of the WHO staff. Many others were people who had gone to the WHO website and were then invited to fill out the questionnaire, a clear invitation to political and ideological manipulation. Another problem emerges in regard to the references used by the report. Of the cited 32 methodological references, 26 were from internal WHO documents that had not gone through a peer-review process. Moreover, only two were written by people whose names did not appear among the authors of World Health Report 2000. To sum up: the report featured data and studies largely generated inside WHO, with no independent, peer-reviewed verification of the findings. Even these most basic requirements of valid research were not met. The report’s margin of error is similarly ludicrous in scientific terms. The margin for error in its data falls outside any respectable form of reporting. For example, its data for any given country were “estimated to have an 80 percent probability of falling within the uncertainty interval, with chances of 10 percent each of falling below the low value or above the high one.” Thus, as Whitman noted, in one category—the “overall attainment” index—the U.S. could actually rank anywhere from seventh to 24th. Such a wide variation renders the category itself meaningless and comparisons with other countries invalid. According to a shocking 2003 Lancet article by Philip Musgrove, who served as editor in chief of part of the WHO study, “the attainment values in WHO’s World Health Report 2000 are spurious.” By his calculation, the WHO “overall attainment index” was actually generated by complete information from only 35 of the 191 countries. Indeed, according to Musgrove, WHO had data from only 56 countries for Health Inequality, a subcategory; from only 30 countries for Responsiveness; and from only 21 countries for Fair Financing. Nonetheless, rankings were “calculated” for all 191 countries. If World Health Report 2000 had simply been issued and forgotten, it would still be a case study in how to produce a wretched and unreliable piece of social science masquerading as legitimate research. That it served so effectively as a catalyst for unprecedented legislation is evidence of something more disturbing. The executive and legislative branches of the United States government used WHO’s document as an implicit Exhibit A to justify imposing radical changes to America’s health-care system, even in the face of objections from the American people. To blur the line between politics and objective analysis is to do violence to them both. What we have here is a prime example of the misuse of social science and the conversion of statistics from pseudo-data into propaganda. The basic principle, casually referred to as “garbage in, garbage out,” is widely accepted by all researchers as a cautionary dictum. To the authors of World Health Report 2000, it functioned as its opposite—a method to justify a preconceived agenda. The shame is that so many people, including leaders in whom we must repose our trust and whom we expect to make informed decisions based on the best and most complete data, made such blatant use of its patently false and overtly politicized claims. About the Author: Scott W. Atlas is a senior fellow at the Hoover Institution and professor of radiology and chief of neuroradiology at the Stanford University Medical Center. AGENDA GAMES: How Today’s High-Stakes Political Combat Works. First, the “It” girl—a concept that means more than mere “perfection.” The “It” factor captures that certain “something” one can’t quite define, but that redirects the attention from anything else whenever “It” appears. Professional entertainers and those celebrity-centric people who follow this sort of thing attribute the term to Elinor Glyn, who wrote the magazine article that inspired the It film in 1927 starring Clara Bow—although the honors for this particular perception of “It” actually go to Rudyard Kipling. But no matter. In frenzied succession, there followed a series of “Its”: female celebrities, “It” hairdos, “It” fashions, “It” songs, foods, and even exercise regimens. All seemed to define their era, the prevailing mentality, or even an entire generation. In American politics, the “It” moments came with the close of World War II (“happy days” were here again), with the Communist takeover Saigon (the first “war” America ever “lost”)—and in 2012, the first time the Republic had ever been thought of as “threatened.” The “It” years—the years everything changed, up close and visible. Since the 1970s, traditionalists and patriots have seen “It” coming, and dreaded that there would come a time when American ideals would not just be ridiculed in the media, but dismantled by the courts. They worried that elections would eventually be manipulated to such a degree that American values and ethics could no longer be sustained. In the year 2012, the crossroads became clear. But for this author, it happened in a most unexpected way. I was sitting with a neighbor in a café over lunch. It was the week before Christmas, 2011. Though this neighbor had never been a particularly close friend (given our wildly divergent political views), we had lived in the same community for so many years, and even helped each other out on so many occasions, that we were, one could say, on very good terms as long-time acquaintances, if not exactly confidantes. Many of my other neighbors jokingly called this woman the “resident Commie” behind her back, mostly because she proudly and openly admitted to being a Marxist in the hippie-dippy days of our 1960s youth. She had participated in protests and demonstrations, somehow managing to squeeze them in amongst her college studies and various doctoral degrees. But on this particular day, she was protesting something altogether different. She confided, to my astonishment, that she was leaving the Washington area—this place where everything is vital and “happening”: the museums, the Kennedy Center, the Fireworks over the Capital on the Fourth of July, the plentiful ethnic restaurants, and Capitol Hill. She was headed for fairer fields in the Great Southwest, of all places—home to the same Confederacy and “rednecks” she had often denigrated. My neighbor was blissfully unaware, apparently, that the District of Columbia and its surrounding bedroom communities exemplified the very lifestyle for which she had once demonstrated, marched and chanted slogans during our coming-of-age years—the only era, we both once thought, that really mattered. Regardless of our politics (we didn’t even know each other then), we imagined ourselves on the cusp. We were first-wave Baby Boomers, born immediately after the War. The “times, they were achangin’,” and lucky us, we were part of “It”! We were the “It Generation,” the Ones Who’d Change the World. Despite her multiple Ph.D.’s in cutting-edge disciplines such as women’s studies, political “science” and environmentalism, in my neighbor’s mind, the “Its” had accomplished next to nothing, leaving the “Me Generation” in charge. Like most young people our age, I was never part of the “It” crowd, having stupidly declared a major in a financially responsible (if not particularly emotionally satisfying) career. I’d looked around for (and gratefully found) Mr. Right, rewarded my parents with respectable, if not exactly stellar, grades, and “ate my peas” (to use a quip from President Obama). “It” was all very confusing… When did “It” turn into “Me”? Was it merely “all so simple then,” as per the song from the tear-jerker film, The Way We Were, starring Barbra Streisand and Robert Redford? Well, from the way my neighbor was now shaking her gray locks, things certainly hadn’t turned out as expected. … Can’t even take your dog for a romp in the woods without some @#$% lazy pig snooping around making sure you have a baggie clipped to your belt! And no trash cans! All these taxes, and not a single @#$% garbage bin to dump your baggie full of droppings! Do they really think people want to walk for an hour in the great, green outdoors with a bag full of p_ _p in their hands? I smiled. In commiseration…among other things…. As my neighbor carried on with her laundry list of grievances, my mind wandered: For some reason, I fancied how she might have looked as a 10-year-old, riding a bike and thrilling to the feel of the wind blowing through her hair. I imagined her frolicking into the school building in the morning, flagging down a friend in the hallway—no gauntlet of metal detectors and pat-downs standing in her way. No concerns that some monster would jump out of nowhere and start shooting. I imagined her laughter and delight as she and her siblings lighted “sparklers” on the Fourth of July. She might have caught me smiling, but it was not at her rant. Rather, it was at the image of her enjoying buying a gooey ice-cream sandwich from a machine at the local theater on a Saturday afternoon, with no notion of some entity called the “food police.” Or as a teenager, with a bunch of other kids at Tops Drive-in, ordering a burger—and the best, thickest milkshake in town. I pictured her…or maybe I was picturing us—or maybe the little girl in my mind’s eye was…me…? Whatever became of those of us who were hopelessly…well, “nerdy” in today’s lingo? Never “brave” enough, or “popular” enough, or self-serving enough to qualify for the “It” crowd. All those “Me’s” who didn’t have the leisure (much less the parental support) to demonstrate against anything! We didn’t know it then, but We were still in the majority—on our way to independence, selfsufficiency and self-reliance. Unfortunately, press accounts of the 60s pretended otherwise, so we had no idea. “Changes … they were a-comin’,” the pundits said. And the world would belong to the counterculture radicals. It would be the “It” kids—like my nowgrown neighbor—the “radicals” and the “counterculture” fighting against the Establishment—who would rule America. Yet, somehow “We, the People” had found each other and reconnected, in cities all around the country via the Internet. We may not have been actual classmates, but we had similar stories, and deep down each of us knew an “It” day is a-comin’. And now, apparently, so did my left-leaning neighbor. So, she had decided to run, to run away—down to “Dixie,” of all places. I wondered if she realized that the great liberal activist folk singer we all loved, Joan Baez—even with her astonishing voice and range—today would never make it past the stage door with her signature piece, “The Night They Drove Old Dixie Down.” The word “Dixie,” in any context, is so politically incorrect that it cannot be uttered in public. Like the old Christmas standby, “I Saw Mommy Kissing Santa Claus,” Baez’s “Dixie” song is a relic of the past, when terms like “husband,” “wife” and “fiancé” were not referred to as “partners” in TV ads. What a difference a few years makes! I mused. My neighbor, unfortunately, will not escape the rules she helped precipitate—and now despises—in the Great Southwest. So, who, will stand as the “resisters” now? Which side will throw in the towel—or maybe throw down the gauntlet? “It” was kind of hard to say. The world’s billionaires and the “mainstream” media work long and hard to narrow America’s choice of candidates, be it national, state or local races—and no matter who, technically, sits atop the heap with the most endorsements from average Americans. Yet, both the media and the political parties tell us, over and over, that “every vote counts.” Most people think it doesn’t. What if “We, the People” did the unexpected? What if a candidate played the game and tricked the pollsters? Polls, after all, are mostly extrapolations from a sampling of a few hundred individuals. The media pays attention to them? Should we? With a start, my attention returned to my grumbling neighbor. Just how “radical” was she? Would someone like her—a member of the “It” 60s-counterculture—be a help or a hindrance now? Maybe my neighbor’s frame of mind was merely signaling a “fight or flight” response—like before the Nazis invaded Poland in the 1930s, or before the tanks rolled into Hungary in the 50s, or ahead of the Rwandan genocide in the 1990s… Maybe she’d go to the polls at election time and vote the way she always had—Left. In any case, my neighbor’s angst made me think: Maybe this was really “It”! 1. We can potentially spend our entire gross domestic product (GDP) on health care in useful ways. 2. Whatever portion of our income we are spending on health care today, we are likely to want to spend more in the future. 3. We have suppressed normal market forces in dealing with characteristics one and two. These facts are not in dispute. Rather, they are readily acknowledged by all health policy analysts. Also, the first two characteristics are not unique to health care. They are true of many other goods and services as well. But when combined with the third characteristic, they have devastating implications. Medical research has pushed the boundaries of what doctors can do for us in every direction. The Cooper Clinic in Dallas now offers an extensive checkup (with a full body scan) for about $1,500 or more.2 Its clients include Ross Perot, Larry King, and other high-profile individuals. Yet, if everyone in America took advantage of this opportunity, we would increase our nation’s annual health care bill by a third. More than 900 diagnostic tests can be done on blood alone,3and one doesn’t need too much imagination to justify, say, $5,000 worth of tests each year. But if everyone did so, we would double the nation’s health care bill. Americans purchase nonprescription drugs almost twelve billion times a year and almost all of these are acts of self-medication. Notice that in hypothetically spending all of this money we have not yet cured a single disease or treated an actual illness. In these examples, we are simply collecting information. If in the process of search we actually found something that warranted treatment, we could spend even more. One of the cardinal beliefs of advocates of single-payer health insurance is that health care should be free at the point of consumption, regardless of willingness or ability to pay. But if health care really were free, people would have an incentive to obtain each and every service so long as it had any value to them. health care even though, as a practical matter, that would be impossible. “Free” health care is of course not really free. It is care paid directly by employers, government or some other entity, and indirectly by workers and taxpayers. The more employers pay for health care the less employees receive in wages. The more the government pays, the less after-tax income taxpayers have. Therefore, allowing patients to go on an unconstrained shopping spree in the medical marketplace would ultimately impoverish all of us. No serious person wants this result. Not even the advocates of single-payer health insurance want it. Instead, they envision placing many obstacles in the path of patients and doctors in order to constrain spending. These obstacles may not be prices, but they most certainly involve costs, such as the cost of waiting for care. Although its advocates call national health insurance “singlepayer insurance” these days, its distinguishing characteristic is not control of demand. It is control of supply. Like the systems of Canada and Britain, American health maintenance organizations (HMOs) also make health care free to their enrollees at the point of delivery. They then control access to care, especially expensive care, on a case-by-case basis. Whether or not an HMO patient gets an MRI brain scan, for example, depends upon the symptoms and the probable outcome of the scan, as well as its cost. HMOs, therefore, control costs by curtailing demand. Nothing like that happens in countries with national health insurance, however. For one thing, doctors in Canada would have no idea how much a scan actually costs and therefore would have no basis for comparing costs with probable medical benefits. The number of brain scans is controlled in Canada, not on the basis of a case-by-case review of patient conditions, but because of spending constraints to limit the number of MRI scanners. Many American doctors have endorsed the single-payer idea, in part because they envy the ability of Canadian doctors to practice medicine without managed care-type, third-party interference. What they overlook is that, at least from a budget perspective, Canadian officials have no reason to care what decisions doctors make. They limit the number of scanners, and therefore the expense of scanning, before doctors see even a single patient. American physicians who support single-payer insurance also tend to discount lack of access to expensive diagnostic equipment in Canada, believing that the problem could be ameliorated by just spending more. They do not realize that the only reason the Canadian system works at all is because the government controls supply. If Canadian doctors (who, again, have no idea what anything costs) had access to an unlimited supply of MRI units, they might spend Canada’s entire GDP on brain scans! In general, countries with national health insurance control costs by imposing arbitrary limits. They strictly control the number of doctors who can be specialists. They limit access to modern medical technology. The more expensive the service, the more difficult they make access. As a result, in countries with national health insurance, people wait. They wait in the offices of general practitioners. They wait to see specialists. They wait for surgeries. And waiting is a rationing device comparable to money prices in a market system. On the demand side, the problem with a system with no money prices is that people view each good or service as though its price were zero. As a result, they tend to try to consume the item so long as it has any value at all. The problem this creates is enormous waste. People seek services until the value to them is almost zero, even though the cost of these services may be quite high. The upshot is that people consume services for which the social benefit is well below the social cost. In Britain, for example, people have to pay out of pocket to see a movie, go to the theater or witness a sporting event. But the only costs to see a physician are the costs of travel and waiting time. So although the government makes an enormous investment in their training, British physicians spend an inordinate amount of time on trivial complaints. In the United States, things are not that much better. Although no one wants to enter a hospital, once there, the typical patient in this country has an incentive to use hospital services until they are worth only two cents at the margin (or about 1/50th of the actual cost). Aside from the costs of time and travel and the risk of being around other sick people, patients have an incentive to utilize physicians’ services until they are worth only twelve cents on the dollar. And for the health care system as a whole, our incentive is to spend until the services we receive are worth only eighteen cents on the dollar. No wonder there is so much waste! In principle, there are not many solutions to this problem. Someone must choose between health care and other uses of money. The question is, who will that someone be? The answer of single-payer advocates is medical bureaucracies answerable to politicians. And much of this book will be spent looking in some detail at how rationing decisions are made in these systems. A second method for choosing between health care and other uses of money is the method of managed care. The paradigm is the HMO. As noted above, HMOs have far less rationing by waiting than do national health insurance schemes. One reason for the difference is that HMOs tend to make rationing decisions based on medical and economic rather than political considerations. Because some policy analysts believe that a system of competing managed care organizations can solve the problems of single-payer health insurance, we devote a chapter to that idea. So far, these accounts have mainly been used to pay relatively small medical bills, less than a few thousand dollars. These are the expenses that fall under a health insurance deductible. But as the accounts grow and if health insurance evolves toward the casualty model, the accounts could play a role in almost every aspect of health care. Consider homeowner’s casualty insurance, for example. If hail damages a roof, an insurance adjuster surveys the damage and agrees to a sum sufficient to cover the cost of repair—usually by a repair service the insurer knows. But the homeowner is not restricted to this option. He or she can choose other, more expensive repair services or even choose to replace the damaged roof with a nicer roof. In principle, health insurance could work the same way. In the case of expensive heart surgery or cancer care, the insurer could direct the patient to a hospital or clinic and agree to pay the full cost. But the patient would be free to take the same reimbursement amount and apply it to another hospital or clinic, paying any extra charges from an HSA account. In the world of casualty insurance, auto repair shops act as agents of automobile owners. Roofing repair services act as agents of homeowners. Suppliers of these services do not see themselves as agents of third-party insurers. In a similar way, HSAs could free patients to become the real decision makers, choosing between health care and other uses of money in virtually every part of the health care system. In such a world, doctors, nurses and other providers would see themselves as agents of their patients rather than agents of impersonal bureaucracies. Continued in the April, 2014 HPUSA newsletter. . .
Let’s now turn to a second well-documented, but rarely discussed, fact about modern health care systems. Whatever we are spending on health care today, we are probably going to want to spend more tomorrow. This is true for two reasons: first, the average age in all developed countries is rising and health needs increase with age, and second, health care is a “superior good,” which means as income grows people choose to spend more of it on health care. At 15.2 percent of the GDP, the United States spends more of its income on health care than any other nation, a sum that equals $1.6 trillion.11 This fact is a usual source of criticism both at home and abroad. But if you think 15 percent is high, you haven’t seen anything yet. Currently, senior citizens (over sixty-five years of age) spend about 45 percent of all their consumption (regardless of who pays for it) on medical care. By 2020, it is estimated that three-fourths of all consumption by seniors will be on health care. Is such spending good or bad? That depends on whether people are getting their money’s worth for the dollars they spend. If people are getting value for money, nothing is wrong with devoting more resources to health care. If they are not getting value for money, something is wrong with it. This way of looking at the issue is very different from what one hears in most public policy discussions. The standard complaint is that health care “costs” are rising. And innumerable conferences, briefings, books, articles, essays and so forth have sought to “solve the problem” of rising health care costs. Note that in a general sense “spending” and “costs” are the same thing. If people are aging and their incomes are rising, one can predict with great confidence that they will want to devote more of their income to medical care. Not only is this not a “problem,” it is a natural and inevitable part of life. Indeed, to the degree that this phenomenon is viewed as a problem, it is not a problem that is going to be solved. It will only get worse through time. We noted above that in a system with no prices, decision makers cannot determine what value people place on different services. Thus, they cannot know what’s being oversupplied or undersupplied. A similar problem arises with respect to total spending on health care. Given that it should rise over time, by how much should it rise? How would one know? Without markets through which people can reveal their preferences for health care versus other goods and services, it’s anybody’s guess. American employers who complain about the “problem” of rising health care costs are in a similar situation. Because decisions about health care typically are made collectively at the workplace and because the premiums employees pay rarely reflect real costs, employers have no way of discerning their employees’ willingness to trade off higher wages for more health care, except through union negotiations and other imperfect devices. Fortunately, when American employers make a mistake, its consequences are confined to their companies and their workforces. But when the managers of national health insurance make mistakes, the whole nation suffers. Some of the things we have been saying about health care are also true of other goods and services. For example, we could probably spend our entire gross domestic product on automobiles, with each of us owning several to use over different terrains and in different seasons. But no one ever asserts that this is a problem. To the contrary, most people regard it as an opportunity. The fact that automobile manufacturers have discovered so many different ways to satisfy our needs makes us better off, not worse off (pollution problems aside). Similarly, fine wine is probably a superior good. As people’s income rises, they tend to buy more of it. And in recent years, supply has increased to meet demand, as vineyards have expanded all over the world. Again, no one regards this as a problem. So what makes automobiles and fine wine different from health care? Why are problems that cause so much hand-wringing in health care not seen as problems in the other two markets? The answer is that in this country and in all developed countries we have suppressed the ability of the market to allocate health care resources. The suppression of the market in health care began more than 100 years ago. It started with controls on who could be a physician and how those licensed to practice should behave. By the mid-twentieth century, controls were extended to the hospital sector and then to health insurance. By the 1970s, with government paying more and more medical bills, policy makers realized that prices and markets were not able to do their job. Similar trends occurred in other developed countries. What does it mean to suppress normal market forces in health care? Not long ago, if a doctor competed aggressively against other doctors, say, the way auto companies compete against each other, he or she could be in real trouble. For example, if the doctor posted his normal fees and compared them to other doctors’ fees, if he compared the quality of his practice to that of another physician or if he advertised at all he could be expelled from the county medical society. That, in turn, would lead to a loss of privileges at all the hospitals in his area. If the offense were bad enough (irritating enough to his fellow physicians), he could lose his license to practice medicine. Until very recently, the hospital sector was dominated by nonprofit institutions whose sole task was to facilitate the doctors’ goal of treating patients. Not only were hospitals not supposed to function like businesses, they went out of their way to avoid certain common business practices. For example, for a hospital to compare the quality of its care to the quality offered by a competitor would have been unthinkable. Advertising itself was unthinkable. Not only did hospitals not post their prices, no one paid them other than the occasional uninsured patient. At the time Medicare (for seniors) and Medicaid (for the poor) were adopted in the 1960s, virtually every hospital in the United States was paid by insurers based on cost-plus reimbursement. And when the federal government set up Medicare, it joined the cost-plus system, paying for health care the way it paid for weapons systems. All in all, the health care system in this country and throughout the developed world functioned according to rules that resembled a medieval guild more than a complex modern market. Times have changed. And they have changed more in the United States than anywhere else. Other countries have left in place the medieval guild approach to medicine and tried to control costs in crude ways that we will examine. In this country, however, we have made dismantling the guild and promoting competition a public policy goal. Doctors today can compete in almost any way they like. They can post prices; they can advertise; they can boast about the quality of care they deliver. Hospitals can do the same. And insurers can pay hospitals based on any arrangement that can be reached through no-holds-barred voluntary exchange in the marketplace. But although the shackles have been removed and although the law no longer protects it, the 100-year-old culture that has dominated medical practice has not disappeared. But there are two consoling observations: first, the medical marketplace is becoming more competitive, and second, things are much worse in every other country. Read the entire article. . . Continued in the October 2014, HPUSA Newsletter . . .
HAVE OTHER COUNTRIES FOUND THE ANSWER? • Prohibit private insurance or personal payment for any service covered by the single-payer system. In advancing this idea, they point to other countries as examples of health care systems that are superior to our own. Are they right? The promise of national health insurance is that government will make health care available on the basis of need rather than ability to pay. That implies a government commitment to meet health care needs. It implies that rich and poor will have equal access to care. And it implies that more serious needs will be given priority over the less serious. Unfortunately, these promises have not been kept. • Wherever national health insurance has been tried, rationing by waiting is pervasive—with waits that force patients to endure pain and sometimes put their lives at risk. • Not only is access to health care not equal, if anything it tends to correlate with income—with the middle class getting more access than the poor and the rich getting more access than the middle class, especially when income classes are weighted by incidence of illness. • Not only are health care resources not allocated on the basis of need, these systems tend to overspend on the relatively healthy while denying the truly sick access to specialist care and lifesaving medical technology. • And far from establishing national priorities that get care first to those who need it most, these systems leave rationing choices up to local bureaucracies that, for example, fill hospital beds with chronic patients while acute patients wait for care. It might seem that some of these problems could be easily remedied. Yet, as the years of failed reform efforts in Britain and Canada have shown, the defects of single-payer systems of national health insurance are not easily remedied. The reason: the characteristics described above are not accidental byproducts of government-run health care systems. They are the natural and inevitable consequences of placing the health care market under the control of politicians.17 It is not true that health care policies in countries with singlepayer health insurance just happen to be what they are. In most cases, they could not be otherwise. money on a handful of patients (read: small numbers of voters). Democratic political pressures dictate the redistribution of resources from the few to the many. Why are sensitive rationing decisions and other issues of hospital management left to hospital bureaucracies? As a practical matter, no government can make it a national policy to let 25,000 of its citizens die from lack of the best cancer treatment every year, as apparently happens in Britain.18 Nor can any government announce that some people must wait for surgery so that the elderly can use hospitals as nursing homes or that elderly patients must be moved so that surgery can proceed. These decisions are so emotionally loaded that no elected official could afford to claim responsibility for them. Important decisions on who will receive care and how that care will be delivered are left to the hospital bureaucracy because no other course is politically possible. Why do low-income patients fare so poorly under national health insurance? care for the poor. Single-payer health insurance extends the “free ride” to those who pay taxes to support it. Such systems respond to the political demands of the middle-class population and serve the interests of this population. Why do the rich and the powerful manage to jump the queues and obtain care that is denied to others? Because it could not be otherwise. These are the people with the power to change the system. If members of Parliament had to wait in line for their care like ordinary people, the system would not last for a minute. Follow this series . . . Continued in the January 2015, HPUSA Newsletter . .